A while ago I gave you a recipe for Burgundy Beef which is the classic french recipe for cooking tougher beef cuts. Today I'm going to give you the chicken version. - Fry the bacon until crisp, then remove and put into the slow cooker. - Add the olive oil and brown all the chicken pieces. Remove and put into the slow cooker. - Add the onions and when they start to brown add the celery and mushrooms and saute until soft. Add the garlic and saute just for a minute more. Don't let the garlic burn or it will be bitter. Pour all this into the crockpot. - Add the bay leaf and the thyme, cover and cook on low heat for 8 hours or on high for 4 hours. Check to make sure the chicken is cooked (The juices will run clear from a leg or thigh). If not cook for another hour and try again. 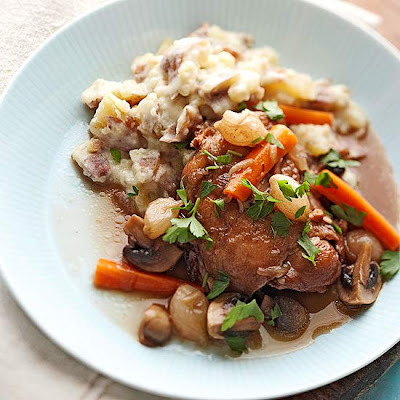 - Remove the chicken to a baking dish or deep plate, removing the Bay leaf. If eating right away, place in a low oven to keep warm. - Pour the sauce into a saucepan and over high heat bring it to a boil and reduce it by half. This will probably take about 10 minutes. Add the parsley and season with salt and pepper. 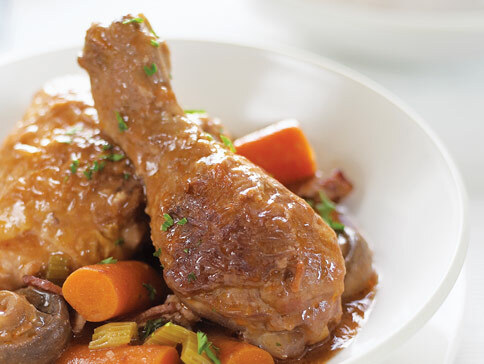 - Either pour the sauce over the chicken or serve separately in a gravy boat. YUM! I will be making this, soon!